I want to show you something one of my daughters made for me. My oldest daughter has begun papercutting and is loving it! 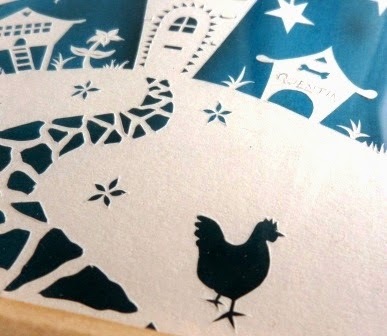 She made me a gorgeous whimsical personalised papercut for Mother's Day - this house has chickens (complete with cute chicken coop) and a little dog kennel too! Oh, and with the name Quentin papercut onto the kennel! The finished piece measures 6" square and is cut from one sheet of paper, so some of these details are really very intricate...her artwork is always highly detailed and precise, so papercutting suits her style, I think. The papercut is mounted in a 3D frame, and in artificial light, the papercut throws shadows onto the colour at the back. I love the effect. I really think she could start selling these (she's got some health problems and is finding her current work, dog grooming, quite difficult as it's very physical work at times). What do you think about her papercut? If you have any comments, I'll pass them onto her! 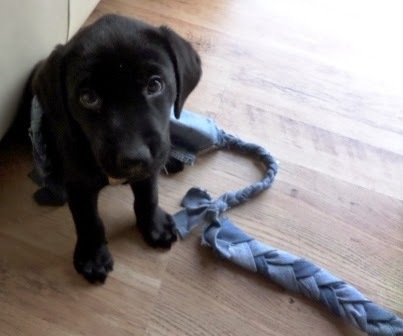 Guide Dog puppy Quentin is learning to walk on the lead. He's not allowed out where other dogs are for another week yet, but I can walk him on the driveway and in shopping centres. 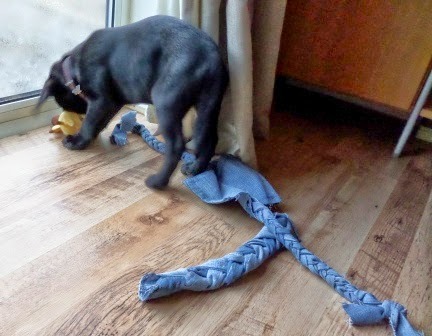 The support from Guide Dogs is really good - I have a lovely and very helpful Puppy Walking Supervisor who gives me lots of tips and techniques for getting him to do things. He's got a long way to go as far as lead work is concerned - but I was thrilled when one of the techniques meant he trotted nicely by my side instead of pulling! In case you're interested, the trick was having a lure (a toy or tiny treat) in your hand, near him but just out of reach. He gets to play or gets the treat during or after his short walk! Of course, all that lead work and playing makes a boy tired...his gentle snoring and muffled sleepy woofs really make me smile! Actually, I think Her "Style" would work well in Children's Book Illustrations..? I think your daughter's got a real talent for papercutting. Good to hear the Quentin training is going well. Wow, that papercut is truly stunning. She is so very talented - Like mother like daughter! The papercut is lovely, and I'm sure she would be able to sell them easily. Also she would be able to get lots of tips from you. Your daughters work is amazing! I think paper cutting is so beautiful. What a lovely gift! She should def try and sell some and I agree that her style of work lends itself to illustration. Am back after a long absence! Your daughter should definitely start selling her papercuts....they're simply stunning!!! Sleepy woofs are so cute, aren't they? 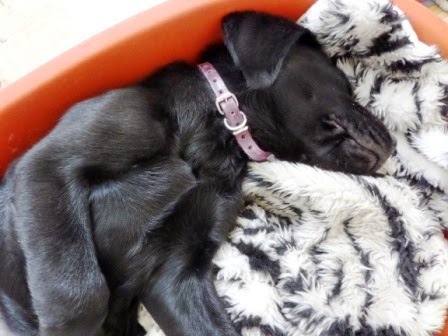 And you know the pup is having a lovely dream! I think your daughter could definitely sell her paper cuts - especially if they were personalised as they are so popular at the moment. Your daughters papercutting is amazing. I love the finished product but I really don't think I have the patience to try it myself. I admire her steady hand and attention to detail so much. 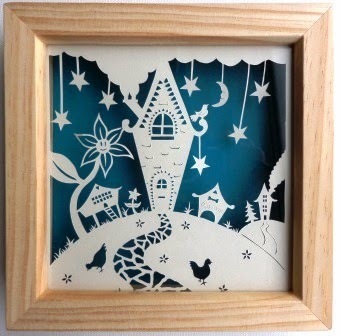 Your daughter's papercut is beautiful, she must have a fantastic imagination to have designed it herself. I love papercutting too, being able to make a living from it would be a dream! oh my... Such a beautiful, professional papercut, looks amazing, yes she should definately sell them. Your daughters paper cutting is fantastic! I really admire the skill and patience needed! Wow, your daughters paper cut picture is beautiful, she is really talented. Your daughter is VERY clever! Love the cute pup too! What an amazingly talented woman your daughter is - clearly she takes after her mum. She should definitely make some to sell, I'm sure they'd be very popular. Your daughter's papercut picture is fabulous! Such amazing intricate details and a beautiful result! Your daughter's paper-cutting is beautiful. glad Quentin is learning the 'ropes' Hope you have a good week. WOW!! I have often wondered about trying paper cutting but so worried I won't be precise enough. Your daughter has made it look so easy! It really has inspired me to give it a go! Will post a link if I actually manage it! I hope she will continue to do more.. what a talent!